Green is one of those colours that a lot of artists have trouble coming to grips with. Me included. Maybe it's not so much the colour but the subject as I think of landscape frequently when I think of greens and the vastness of landscapes can be daunting. I can't give you a precise formula for mixing greens, as I use so many small amounts of other colours when creating a colour which is specific to the subject and light. But I can share the basic colours that I do use as the hopping off points for many different shades of green. These two mixes provide strong basic greens to which I can lighten with the yellow or darken with more blue, changing the way they "lean" i.e. warmer or cooler. With the addition of other colours I can create other hues. You can watch a short Youtube video I made on basic colour mixing here to see some of the base greens that I mix using these colours. And another on colour matching here. This one deals with the principle of colour mixing and doesn't specifically deal with the colour green. Celebrating St. Patrick's Day? 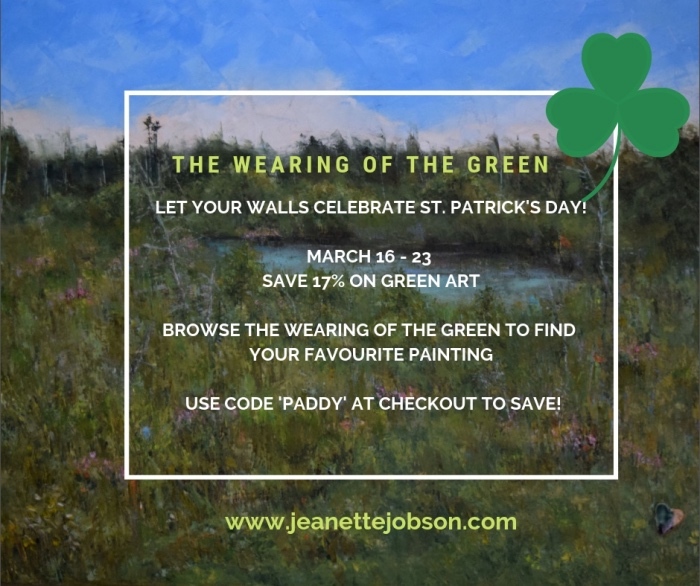 Let your walls join in and celebrate "the wearing of the green" all year round! Save 17% from March 16 - 23 on select original green paintings. Click here to see what's available. I am a professional visual artist in northeastern Newfoundland and Labrador. I am inspired by the ocean and boats. Reflections and colour are a large part of my work as well as creating the nuances in values that make these things so unique. I am an impressionist painter working with a palette knife, however, I do use other mediums for small paintings and create original prints in the form of linocuts and etchings. You can find my larger works on my website www.jeanettejobson.com. The process of creating a piece of art is often shown on my blog http://illustratedlife.blogspot.com through works in progress, tutorials and sometimes giveaways! I also accept commissions and teach drawing and palette knife painting through workshops and privately. You can also find me on Facebook (jeanette Jobson Fine Art) or Twitter (jeanettejobson). Drop by and say hello, I'd love to meet you and share my journey. Join my mailing list. Art and conversation. Straight into your inbox. All images and artwork on Illustrated Life are copyrighted by me. I am often willing to share, provided that you ask first. Please do not download, copy or use my images without my permission.